How to find good candidates? Not all devices are created equal. But how can device manufacturers identify the low-hanging fruit for a risk-sharing arrangement? Needless to say, the more characteristics a product has that are associated with successful risk-sharing arrangements, the more such an arrangement is likely to succeed. To illustrate, in Exhibit 1, we chart a select number of risk-sharing arrangements established since 2015 along two key dimensions: product effectiveness and time needed to observe expected outcomes. The findings are based on clinical studies of the products displayed, including nine prescription drugs (13 agreements) and three medical devices (four agreements). Ideally, a good candidate should have a medium or large effect size and the outcomes should be observable and measurable in about a year. The dotted line rectangle in the figure captures the products that fit these characteristics. Devices that satisfy these two criteria are more likely to succeed and protect manufacturers from downside risk. Given the select nature of study populations, uncertainty always surrounds the estimated effect size in any clinical study. Thus larger effect size estimates can help guard against the possibility of downside risk associated with patient outcomes. In addition, to ensure that effect size estimates are generalizable to the target patient population, products must be tested in real-world settings, i.e., beyond clinical trial settings, before an agreement is signed. For practical reasons, we advocate a time frame of one year or less for risk-sharing agreements is optimal: Organizations—including manufacturers, providers, and payers—often use an accounting period of one year. A risk-sharing arrangement that requires more than one year to measure outcomes will have difficulty in getting buy-in from stakeholders and is more likely to be terminated before the results are ready for review. Note: Authors’ analysis of published clinical studies for products in a recently established risk-sharing contracts (2015-2017). An effect size of 0.2 is considered small, 0.5 median, and 0.8 large. LDL: low density lipoprotein. CV: cardiovascular events such as stroke and myocardial infarction. As Exhibit 1 shows, all three medical devices are within the rectangle, but a number of prescription drugs are not. Device manufacturers may be more selective than drug manufacturers in establishing risk-sharing arrangements. The risk-sharing arrangements for two of the three devices, VASCADE and TYRX, are between a manufacturer and a hospital. The agreements between Medtronic and Aetna or UnitedHealthcare on the insulin pump are the only publicly disclosed arrangements between a device manufacturer and a payer. In contrast, drug manufacturers sign such agreements almost exclusively with payers or large healthcare systems with their own insurance plans. The difference between the two industries is likely due to the smaller economies of scale for devices compared with prescription drugs, which often account for a larger portion of a payer’s spending. Moreover, the figure shows that drug manufacturers enter risk-sharing agreements for products with small effect sizes, because, more often than not, product effectiveness has considerable uncertainty or intense competition exists within a therapeutic class. In these cases, a risk-sharing agreement is needed to convince a payer to cover the product, and a drug manufacturer often has to concede substantially in the form of discounts or rebates. Cost-conscious payers have been driving a shift from volume-based to value-based care, and some risk previously borne by payers is now redistributed to providers and device manufacturers. The risk-sharing arrangement is an emerging business model embraced by the pharmaceutical and device industries. Risk control is critical in these arrangements. Ideal product candidates for risk-sharing arrangements can be identified through a set of characteristics shared by successful agreements. Device manufacturers can also use other tools for risk sharing, such as embedding options for renegotiation, capping the financial loss, conditioning payments on factors outside the control of both parties, or applying statistical modeling techniques. Brilinta (AstraZeneca and Harvard Pilgrim, 2017); Bydureon (AstraZeneca and Harvard Pilgrim, 2017); Enbrel (Amgen and Harvard Pilgrim, 2017); Entresto (Novartis and Cigna, 2016; Novartis and Aetna, 2016); Januvia and Janumet (Merk and Aetna, 2016); LUXTURNA (Spark Therapeutics and Harvard Pilgrim, 2018); Praluent (Sanofi/Regeneron and Cigna, 2016); Repatha (Amgen and Harvard Pilgrim, 2015, 2017; Amgen and CVS Health, 2015; Amgen and Cigna, 2016); and Trulicity (Eli Lily and Harvard Pilgrim, 2016). 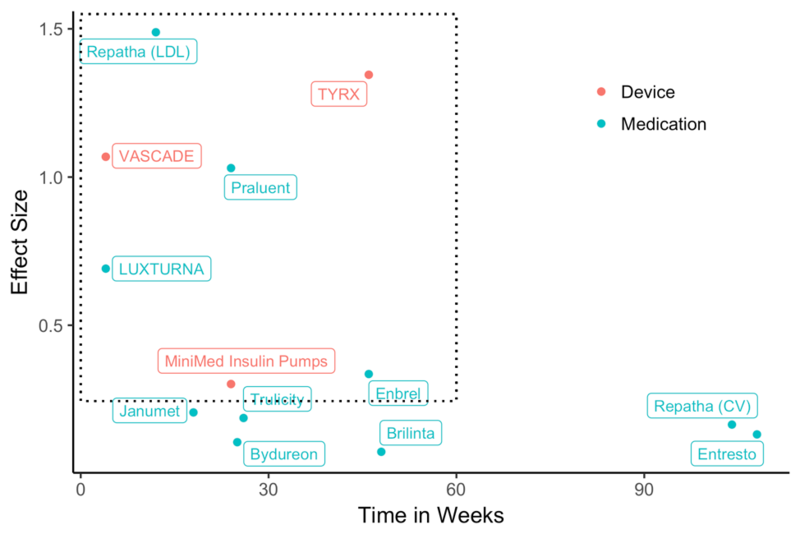 MiniMed Insulin Pumps (Medtronic and UnitedHealthcare, 2016; Medtronic and Aetna, 2017); TYRX (Medtronic and multiple hospitals, 2015-2018); and VASCADE (Cardiva and multiple hospitals, 2017). Harry Liu, Ph.D., is the Practice Lead in Technology, Health Advisory Services at the nonprofit, nonpartisan RAND Corporation [[email protected]]. Christine Chen, M.D., M.P.H., is an Assistant Policy Analyst at RAND.